Dog owners may find that having beautiful hardwood floors and snazzy leather furniture is a big risk. Depending on their temperament, dogs can be pretty destructive creatures. In addition to tearing up objects around the house, their claws can cause a bit of damage. Not only that but sharp claw can be painful to deal with when a pooch is hungry or wants attention. Because of this, some owners may be asking themselves if declawing is an option. The controversial procedure is regularly performed on house cats to prevent scratching of furniture and family members. While it's often frowned upon by many animal enthusiasts and veterinarians alike, the procedure can be a better alternative than abandonment. If it's possible for cats, why not perform the procedure on dogs as well? Is Declawing a Dog Possible? In short, declawing a dog isn't even a possibility. While dogs and cats both have claws, they are built and work very differently. Cats utilize their claws for a variety of reasons ranging from self-defense to climbing. On the other hand, dogs don't rely on their claws for much. They use them to dig and scratch at themselves, but that's pretty much where their use stops. Any harm done with the claws isn't intentional. 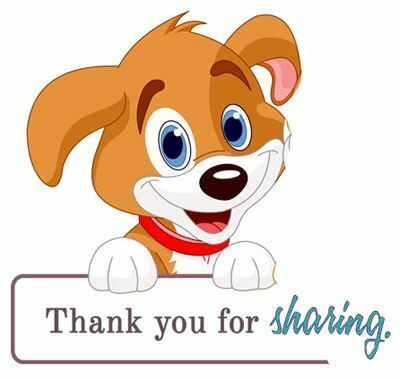 Dog's don't use their claws purposefully other than to perform menial tasks throughout the day. Because of this, there's no reason to have a procedure that removes the claws. Not only that but removing a dog's claws is physically impossible. The declawing procedure isn't designed to accommodate a dog's physical attributes. In fact, the procedure would do more harm than good and handicap their ability to run and walk. To remove the claws of a cat, surgeons must remove the source of the claws. Unfortunately, the source of the claws is the knuckle itself. The claws grow out of the top knuckle, so veterinarians must amputate it to permanently stop nail growth. This is why the procedure receives a lot of negative attention. 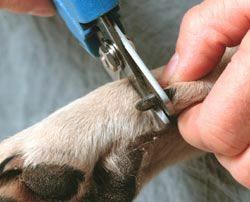 Regardless of how one feels about the process, a dog's feet aren't built the same, so removing the top knuckle is simply not an option. If a dog's claws are becoming a problem, it may be time for a trim. Dogs should have their nails trimmed on a regular basis to avoid damage to furniture and possible injury. The frequency of trimming depends entirely on the rate in which they grow and whether or not the dog wears them down naturally. It's the owner's responsibility to trim the claws. Luckily, there are a few different methods. 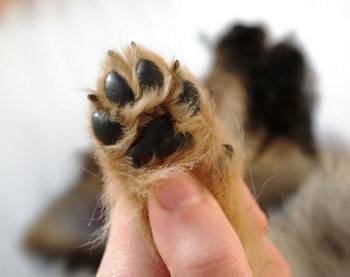 Ideally, a dog's claws would wear down naturally over time to keep them at a good length. This is usually achieved by regular exercise on tougher terrain. Dogs that walk on concrete often don't need to get regular trims because the tough material takes off a bit of nail over time. The same applies for dogs that go on hikes. With that being said, owners may want to smooth the nails out. Tough terrain can lead to jagged edges that make the nails feel sharp. Files can be used to smooth out the texture and round the tips. Clippers are the quickest way to deal with long nails. They are similar to human fingernail clippers but feature a larger blade and guide. Many manufacturers also offer different sizes to accommodate varying thicknesses. When cutting with clippers, it's important to keep an eye out for the blood supply, also called the quick. The quick can be distinguished by a dark spot in the nail. Clippers should stay clear of the quick to ensure that the dog doesn't experience pain or bleeding. If the quick is cut, it will bleed profusely until a styptic powder is used. Unfortunately, the quick becomes longer as the nails grow. This is why it's important to trim the claws regularly. To remedy a long quick, the nails need to be trimmed frequently over a short period of time until it regresses. Grinders are a quick and more precise way to shape the nails. The mechanical device features a rotating block that makes quick work out of tough claws. It provides ultimate control. Not only do they make it easier to get closer to the quick without cutting it, but they also allow owners to shape the claws whatever way they want. To prevent scratching, owners can curve the tip of the claws. Some grinders even come with a nail guide to make the process easier. Nail covers are a revolutionary option to prevent scratches. Essentially, they're pieces of vinyl that encompass the entire nail. While the nails will still require trimming in between applications, the covers will slow down the growth process and prevent scratches. They're predominantly used for cats, but dog varieties are also available. These accessories are shaped like hollow claws. Despite the protection they offer, the covers are thin enough to support the dog's regular activities. They'll still be able to walk, dig, and play without issues. Numerous sizes are available to fit any dog. Owners wanting to add a bit of colorful flair are in luck as they also come in a variety of colors. Nail cover packages usually come with enough caps to cover multiple applications. Each application lasts anywhere between 4 to 6 weeks. During this timeframe, the nails will continue to grow until the caps fall off. Once they fall off, it's time to trim the nails back and prepare them for another application. The covers simply slip onto the existing nail. Before putting them on, a safe adhesive is applied to the inside of the caps. The adhesive dries quickly so that the pooch can continue on with their day. Owners can choose to apply the covers on all the paws to provide optimal scratch protection or on specific feet to target the dog's needs. In short, there's no such thing as a declawing procedure for dogs. Because of how dogs utilize their claws, there's really no need for it anyway. Owners should be proactive and groom the nails on a regular basis. Whether it's with regular trimming or a flashy vinyl cover, well-maintained nails will keep furniture, floors, and family safe from scratches.